Gumby Infant Snap Suit: "Gumby Face"
That quintessential Gumby smile echoes your baby's smile in this infant snap suit. The iconic image is printed on a 100% pre-shrunk Gumby-green cotton snap suit. Take a little Gumby with you wherever you go. This friendly, bendable, posable, mini Gumby will keep you company on all of your journeys. Approximately 2" tall. 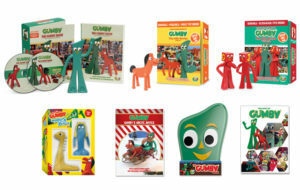 Bring Gumby home for the holidays! This jolly Gumby nutcracker will warm hearts with his familiar smile. Made of wood and adorned with fun accessories, he's a decorative twist on a seasonal tradition. Dress up your best friend in this fun and iconic costume. This premium costume comes in sizes to fit dogs as small as Chihuahuas and as large as Labs. Spur imaginative dreams of Gumby and Pokey with this cool pillowcase. Have some Gumby dreams! This bold and very Gumby pillowcase will brighten your bedroom and put a smile on your face before you sleep. Relax and sleep well with Gumby. The Gumby "Chilling" pillowcase delights the child within us all as we doze off. Gumby and Pokey enamel pins dress up any outfit. Pin them on a hat, tie, jacket, backpack or on a bulletin board to keep these lovable characters with you throughout the day. There are a number of styles, you'll want to collect them all. Travel in style with this lightweight, plastic travel mug with lid. Avoid spills and breaks. This complete 1950s Series collector's edition includes 220 minutes of wild Gumby adventures in the original episode lengths as first aired in the 50s with their original soundtracks. It also features a never-before-produced 1950's style bendable toy. You've never seen Gumby like this before! Gumby Socks: "Gumby & Pokey"
Gumby's on board with the latest socks craze. These fun and comfy Gumby and Pokey socks are sure to make you smile! Sizes for the entire family. He twists, bends, folds, flexes, and stretches... and stretches... up to 48"! And then, returns to his normal size and shape. It's Stretch Gumby! Tie him in a knot, roll him into a ball. A great pal to ignite young imaginations. He can stretch up to 4 times his normal size of 12". Buck Naked Since 1956, is a classic Gumby t-shirt design. This cream colored, 100% pre-shrunk cotton shirt comes in Adult, Youth and more fitted Junior Girls sizes. Gumby T-Shirt: "Friends with Bendefits"
Friends with Bendefits.... what more can we say? A great gift for a special friend. Made of 100% pre-shrunk cotton, this red shirt comes in Adult, Women's, Juvenile, Youth and more fitted Junior Girls' sizes. Gumby T-Shirt: "Fun & Flexible"
Through all the years and exciting adventures, Gumby remains fun and flexible. This Carolina blue t-shirt comes in Adult, Juvenile, Youth and Toddler sizes. Made of 100% cotton, pre-shrunk. Go Green with Gumby! This light blue short sleeve t-shirt will delight Gumby fans. 100% pre-shrunk cotton. Available in Adult, Women's, Juvenile, Youth, Toddler and more fitted Junior Girls' sizes. Be Gumby in this white 100% polyester sublimated t- shirt. In Adult and Youth sizes. Gumby T-Shirt: "Gumby 60th Anniversary"
Celebrate 60 amazing years of Gumby! This colorful graphic is printed on a 100% pre-shrunk charcoal gray cotton shirt. Available in: Adult, Juvenile, Youth, and more fitted Junior Girls sizes. 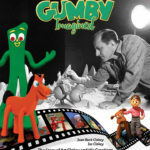 Celebrate 60 amazing years of Gumby! This colorful graphic is printed on a 100% pre-shrunk silver gray cotton shirt. Available in: Adult, Juvenile, Youth, and more fitted Junior Girls sizes. Show your Gumby spirit with this cheerful t-shirt. The iconic image is printed on a 100% pre-shrunk Gumby-green cotton shirt. Available in: Adult, Juvenile, Youth, and more fitted Junior Girls sizes. Gumby T-Shirt: "Gumby for President"
Gumby for President! Let's make America green again! Gumby's platform: More love, kindness, optimism, flexibility, imagination and adventure. This 100% pre-shrunk cotton navy blue shirt is available in Adult, Women's, Juvenile, Youth, Toddler and more fitted Junior Girls' sizes.